Looking for that extra edge in your business? Bestselling authors and renowned communication experts, Allan and Barbara Pease, reveal that it’s time to let your hands do the talking! From persuasive presentations and the creation of your customer base, through to effective communication and interaction with team members, the key to effective management and your businesses success is in your hands…literally! The appropriate use of hand gestures and mannerisms to influence, inspire and engage combined with the ability to recognise and interpret these telltale traits in others is one of the most important communication skills for modern leaders. In their book The Definitive Book of Body Language, Allan and Barbara Pease reveal that the tactical application of hand and thumb gestures can and do make a simple yet powerful difference in our increasingly complex professional communications. Whether it’s winning a negotiation, motivating your sales team, or demonstrating leadership, the hands can unlock the door to management success from the directors’ boardroom to the staff lunchroom. Up to 93% of human communication is non-verbal and the hands and the thumbs could never be construed as the body’s silent partners. Rather, hand gestures and mannerisms give extra voice and power to the words that we use, but for the inexperienced, they can also conspire against you. “Given that there are more nerve connections between the hands and the brain than between any other parts of the body, our hand gestures and positions provide an interesting insight into our emotions and attitudes,” explains Allan. Hand gestures have a diverse emotional continuum from that of confidence, openness, and positive expectation to anxiety, restraint, and negativity. “Palm rubbing, hand clenching, and the familiar steeple, formed by pressing the fingertips together like a church steeple, send revealing messages and signals, sometimes irrespective of the spoken word,” he says. Becoming more aware of hand gestures, both your own and your customers, will help you to gain that “upper hand” when building your sales base, and isn’t that what you want? “Are you really being listened to? Is your customer open to what you are suggesting? Have they already closed their minds to the opportunity you are giving them? Do you need to step back briefly? Did they understand what you just said? Are they eager for more? Learn to be aware of what body language and gestures are silently telling you and make it an integral part of your presentations,” Allan advises. 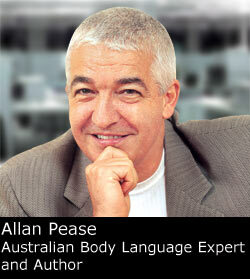 The message for leaders and sales people from Allan and Barbara Pease is practical and immensely beneficial. Rehearse and master the body language gestures of the hands and thumbs and enjoy the “handsome” benefits of a successful career. Increasing your sales will become easier. But hand movements and gestures are not the only form of body language you should be looking out for when you are communicating with someone. The following examples will give you just an idea of the different body language gestures that can give you a very big clue as to what they are thinking. Hiding behind a barrier is a normal human response that we learn at an early age to protect ourselves. As children, we hid behind solid objects such as tables, chairs, furniture, and mother’s skirts. The arms crossed gesture is the primary form of hiding that humans use as adults. When someone is listening to you, they cross their arms when they have negative thoughts about what you are saying, or if they are no longer paying attention. 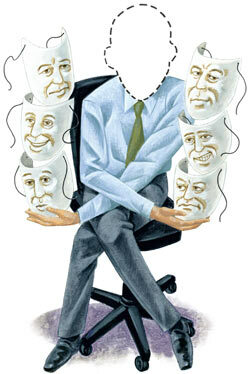 It is used also as a comfortable position when you are feeling uncomfortable, when you are nervous and defensive. Women often use objects to assist them in disguising their arms crossed arm barrier, such as a handbag, or hat. They will hold this to their chest, creating a barrier. In a work environment, if you are making your presentation to your boss and he is displaying some kind of arm barrier, crossing his arms in one way or another, it gives you the opportunity to show insight into your audience. You can ask them what queries they have, how they are feeling at that point in the presentation, get them to voice their opinion, so that you can refute their claims, and turn the negatives into positives. Put their mind at ease. There are many gestures of hand to face that display deceit, negative attitude, and lies. When someone covers their mouth with their hand, they are subconsciously trying to disguise what they are saying, because they know it’s false. A good example of this is the fake cough. The nose touch occurs when a negative thought enters the mind, the subconscious instructs the hand to cover the mouth and then at the last minute try to appear less obvious by touching the nose. Another reason for this nose touching gesture is that when someone is lying, the nerve endings in the nose tingle from increased blood flow to the nose (the Pinocchio effect) and the rubbing action takes place to satisfy that feeling. Touching the eye is the brain’s way of blocking deceit, doubt, or a lie that it sees or to avoid having to look at the face of the person to whom she/he is lying. The ear rub is subconsciously trying to block the words by putting the hand around or over the ear. In given light conditions, the pupils will dilate or contract as the person’s attitude and mood change from positive to negative and vice versa. When someone is excited their pupils can dilate up to four times their normal size and this is easy to observe on blue eyes. Tests conducted with expert card players showed that the experts won fewer games when their opponents wore dark glasses. Dark glasses eliminated pupil signals so that the experts could not read their mood. In simple terms, dilated pupils show a positive attitude, constricted pupils reveal negativity. When you are having serious discussions on a business level, imagine that there is a triangle on the other’s forehead. By keeping your gaze at this point, you create a serious atmosphere that the other can sense. You can also control the gaze of the other person. When giving a visual presentation, using books, charts, graphs and so on, the information relayed to that person’s brain is absorbed via the eyes 87% of the time. So to control where they are looking and what information they are absorbing, use a pen or pointer to indicated what you want them to see, and at the same time verbalise what she/he sees. By lifting the pen up to eye level when speaking after this, you are guiding their sight back to your own face. It’s like a magnet effect that lifts their head so they are looking at you, and therefore absorbing what you are saying.